Mankati E360 provide a perfect solution for fiber reinforced materials like glass fiber and carbon fiber composite filaments. The feeding and extrusion system of E360 is made of high rigidity material, it ensures long service life and excellent printing performance. To make sure hyperstable 3D printing performance, we designed a dual motor feeding system to output persistent high feeding torque. Mankati E360 uses a 3 mm carbon fiber build plate, which has an excellent rigidity, it won't be smashed to pieces. Due to its high impact strength, you can easily remove the prints in one piece by hitting the back of the plate. The photoelectric calibration function gives a quantizable method to leveling the plate, when the nozzle contact the sensor point of the plate, the LED light will shining, calibrate the four sensor point will level the plate. It is a removable build plate which can be easily taken off without any wire connections. 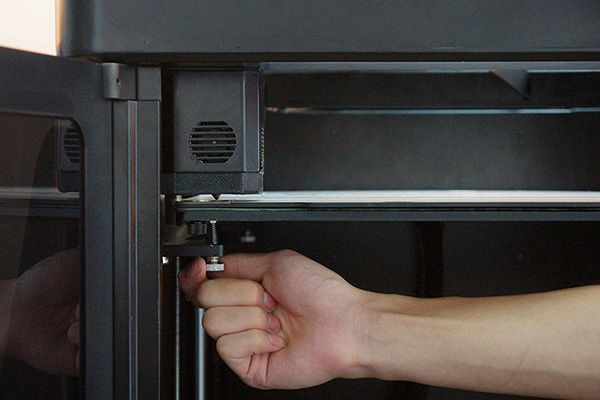 With the StickSurf 3D printing surface, you can printing PLA, ABS, PC, TPU, PETG without using glues and tapes. To bring your office in fresh air even work with the odorous materials, like ABS/HIPS, we build-in powerful air filter inside the printer chassis. To ensure long term durability and precision, Mankati E360 adopts industrial-grade linear rails and ball screws. Mankati E360 is a fully enclosed 3D printer, the enclosed chassis ensures stable inner temperature and high printing performance, you can access the prints by open the front door and the top cover. Together with cluster management and Wi-Fi/ethernet, the on-board camera enabling you to remote monitor your printer and print job. 8GB memory space on board, the system will auto save the print files sent via local network, and auto delete the earliest files when the memory is full. You don't need to keep the USB disk on printer after start printing, this make the file management much easier, to print on different Mankati printers, you just need to save files in one u-disk instead of many SD cards. 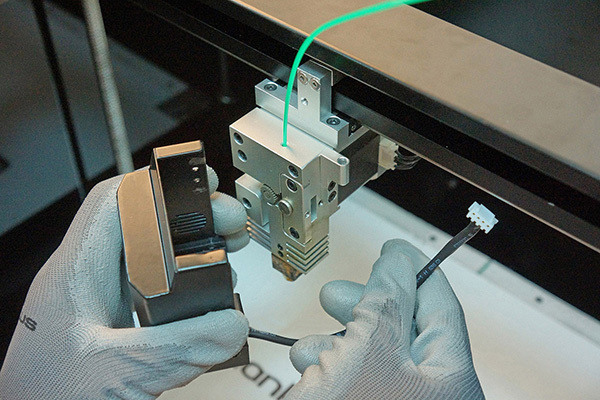 To ensure good printing quality when using nylon and other hygroscopic materials, we standard equipped a PolyBox with E360 which gives a stable humidity space for your filaments. In the meantime, the clean filament path makes your desk clean and clear, also quite reduce the chance of filament intertwining. When the nozzle contact with the plate, the LED light on the inner edge of the plate will flicker. The calibration method is easy and accurate. You can easily maintain the print head without dealing with many screws and wires. 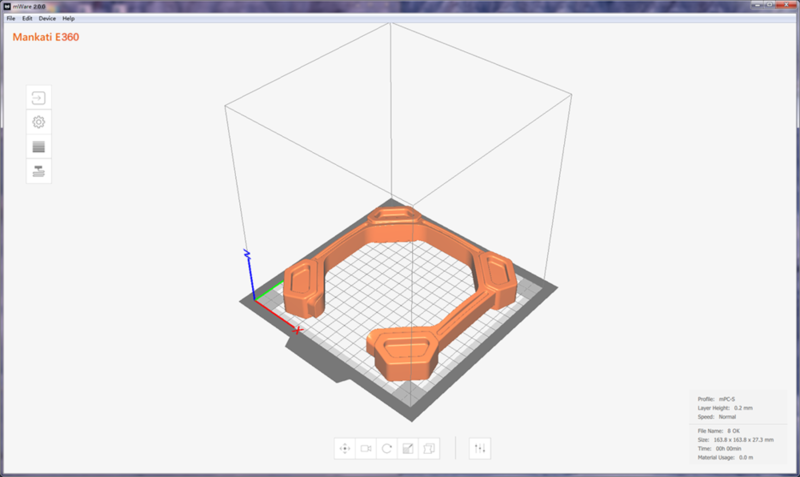 With mRemote, you can achieve the basic operation of Mankati E series 3D printer and monitor the whole printing process just sitting by your computer. No need to shuttle between your printer and computer. It is a good news for the printing service providers, or the users who has multi Mankati E series 3D printers in hand. 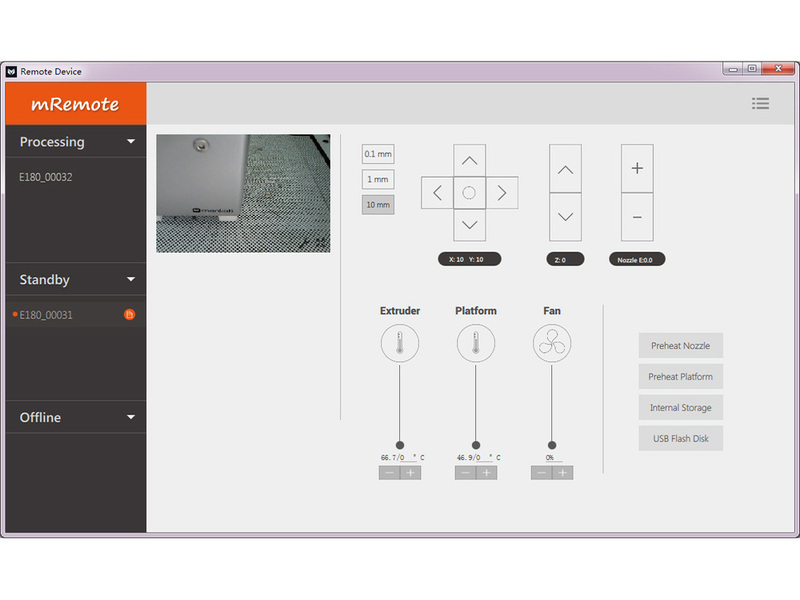 With mRemote, you can manage all your Mankati 3D printers and multi-task simultaneously, which will help you to improve your production efficiency extremely. Available Materials: mNylon 66, mNylon 6, mPP-GF, mABS, mPC, mPLA, etc.